The fundamental political challenge is that there is complete political paralysis. There is complete confusion in the Congress party. Many of the legislations that it has tried to bring, for example, the Food Security Bill, are completely flawed and have huge macro-economic implications. The fiscal-deficit story is not looking good either. It's not clear if they will be able to build a political consensus on tackling energy subsidies. The government has simply not put any political capital behind the big-ticket economic reforms that could position the country to take advantage of the global scenario, be it goods and service tax or unique identification for better delivery of services. After the Lok Pal Bill fiasco in the Rajya Sabha, the cynicism about the Congress will grow. Frankly, the party broke all norms of propriety by not allowing the vote. You cannot govern when your credibility is low. I think the Congress has convinced itself that in the electoral arithmetic, all it needs to do is to show that it is marginally better than the Bharatiya Janata Party, but that is still not good enough for the country. The most important thing about business is confidence. Right now, if you are an investor, you have no idea of what the next year is going to be like. Are we looking at an eight per cent economy with a six per cent inflation rate or are we looking at a six per cent economy with a two per cent inflation rate? Are we looking at a rupee bandwidth of 50-53 or 53-56? Uncertainty is the worst thing for investors and uncertainty is self-fulfilling. What the government needs to do – more than anything else – is send a strong signal that a credible macro-economic manager is in charge and it has just been unable to do that. Shouldn't the government utilise the window of two months that it has before the Uttar Pradesh elections to drive home the right message? You are assuming that it wants to take the opportunity the window presents. The United Progressive Alliance-II got the best window that any government could have got in the last two years. Even though it is in coalition, it had a comfortable surplus, certainly better than the UPA-I. It is deliberately and determinedly shutting down these windows and part of this is because the Congress party leadership just does not understand how the modern world operates. The global economic crisis is such a huge opportunity for India. People are looking to invest in places other than China. Shouldn't we have been taking advantage of that? Doesn't the leadership understand that almost all the things it wants to do by way of welfare and rights depend on government revenues increasing at the rate of 20-30 per cent a year? How do you increase that if you don't have growth? How do you inspire business confidence if you are systematically anti-business, particularly small and medium business? You are back to the 70s. State discretion has grown. State interference in regulators has grown. That basic structure that we wanted in 1991, a rule-bound system, friendly to business, a new social contract that says the job of business is to generate wealth and the government will tax that wealth to help those who cannot participate in this economy. All elements of that social contract have broken down. That doesn't mean that India will come to a grinding halt. There are some underlying drivers. If the savings rate can remain in the 30 per cent range, you have at least some investment going. But nobody in the political system realises that the historical window of opportunity for putting in lasting changes is very small. In our case, it is 10 to 15 years given our demography. If we don't lay the foundation for wealth and prosperity in the next 15 years, then the India story is gone forever. You will then grow old, before you grow rich. Our confusions are very much at the structural level. 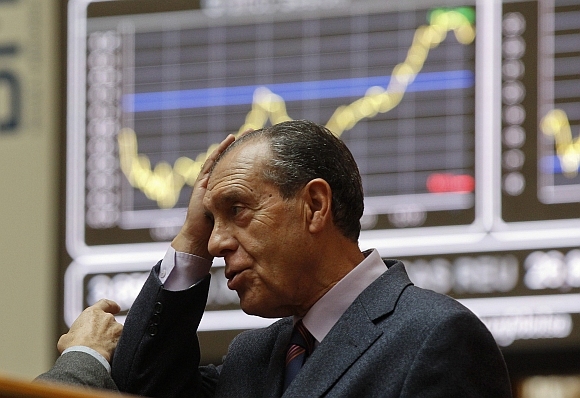 Image: A man holds his head at the bourse in Madrid. European stock futures pointed to a weaker open for equities on Monday as political uncertainties in highly-indebted Italy and Greece raised fresh concerns that the region's debt crisis would intensify and threaten a fragile global economic recovery. The argument is that the government is trying to do what is required but political opposition and inflation are creating bottlenecks. The government is basically lying. The government itself has never been very clear and effectively communicated what its diagnosis was on inflation. Why do we have high inflation? Is it because of fiscal expansion, as some people argue? The government is spending recklessly, so you will get inflation. Is it because of structural supply-side constraints? Now, both these diagnoses points to the government's complicity. Inflation is a reflection of bad government management. The government says there is inflation mostly because states are not taking steps to handle it. What have the states got to do with inflation? What the government needs to understand is that the supply bottlenecks you have are of a very different order. It's not the states' problem that you do not have coal. It's not their problem that we have uncertainty around environmental clearances. It's not the states' problem that National Highway Authority of India is not building roads as fast as it should have. It's not the states' problem that your port constructions have slowed. First, the government creates inflation and then says inflation has tied our hands. The Reserve Bank of India has not been able to effectively communicate what kind of an inflation scenario we are looking at. Now the government will say that our hands are tied because our banks are vulnerable. Three years ago, we were talking about Indian banks being the pearls of the globe's eyes and now they are vulnerable because infrastructure projects are not getting any returns because you have sunk costs and you can't make them operational. 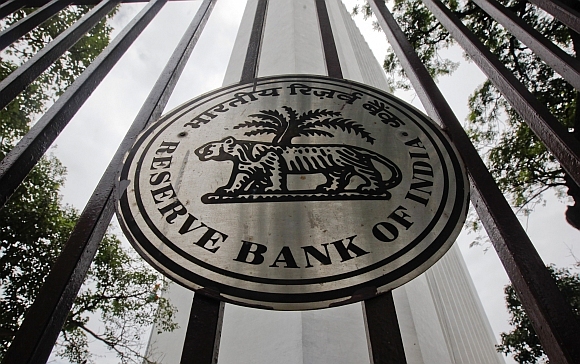 Image: The Reserve Bank of India logo is pictured outside its head office in Mumbai. 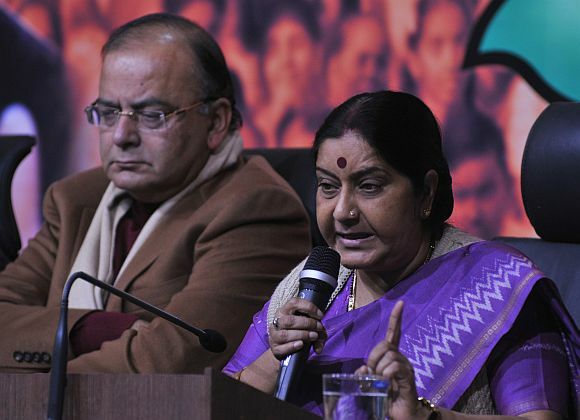 It's true that coalition politics raises challenges but India has had coalition politics for more than 20 years. There is nothing new about this. Coalition politics requires you to be a good political manager and not arrogant or presumptuous, the way the government has been. Take the argument over Foreign Direct Investment in retail. No matter whether you think it's good or bad, what the government did was so cynical. Why do it on the first day of Parliament, when you know it's a particularly important session of Parliament? For two years, you don't prepare the ground for it, there is no discussion on its benefits. Nobody out there knows it's good for the country; it's news even for the people campaigning for it in the Congress party. You can't have Rahul Gandhi saying growth and investment are not good for the poor one day and then have the government say FDI is good for the country another day. Part of the coalition management happens if you are clear in your own conviction about what you want and make a case for it. But the coalition is not the problem, the problem is the Congress party. On every issue, half its Cabinet is split. Do you think the situation will improve after elections in the five states including UP? I honestly think that it would be very hard for them to govern. 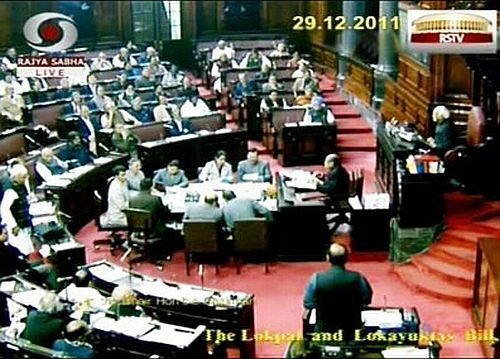 After the Lokpal fiasco, how are they going to do the Budget session? None of the underlying issues have been resolved. Unless there is a massive groundswell in favour of the Congress -- they come comfortably riding home after the UP election, which is very unlikely -- I don't see them having the political capital to run this country. How long this would drag on is anybody's question. You think this will drag on? This will continue. I think if they have political imagination and they want to turn in, they would call for a general election. There is no other way of breaking this logjam. Do you know any government in India's history that has gone through a year without being able to clear any legislation in Parliament? So if you have confidence, go to the people and say our coalition partners are trouble for us. Please vote for us and if you vote for us we will do the right things.